Artist Tony Oliveto’s exhibit at Hilmer Art Gallery, Recent Works, displays his affection for such artists in the minimalist style—Frank Stella, Elizabeth Murray and Piet Mondrian. These artists were all criticized for lack of depth and aesthetic beauty. Similarly, Oliveto’s show risks the same criticism, but it does provide a keen understanding of his style, quality of craft, and sense of humor. Oliveto, a recent MFA graduate of Massachusetts College of Design, is realistically adept—that is, his past drawings, paintings and photographs show great technical perspective and composition of the figure and landscapes. According to the now Omaha-based artist, when he became entranced with American minimalist/abstraction-painter Frank Stella, his whole artistic outlook changed. 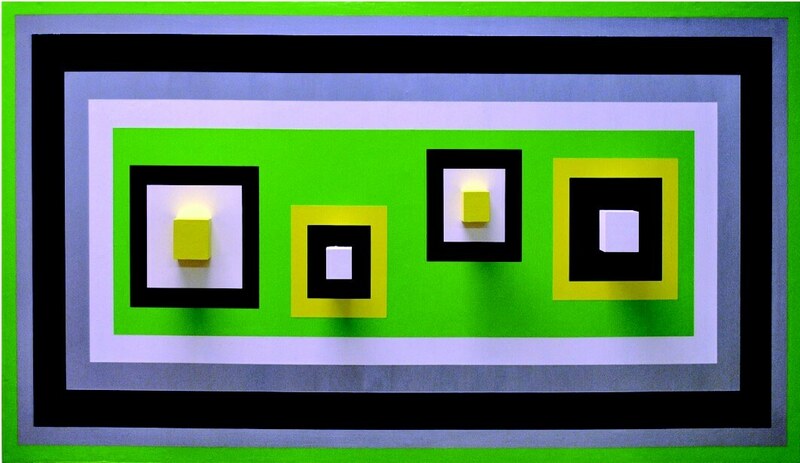 Immediately when viewing his “Happy Boxes” and “Boxes” the relation is clear; the wood boxes painted with acrylic on masonite are stripped of all unnecessary features, leaving only intense, brightly-hued rectangles and squares. The balance and composition are visibly perfected, an ironic play on the movement that aims to focus only on the identity of subjects. Oliveto’s boxes give a fun reminiscence to the 1980s, the decade of Oliveto’s childhood, with references to the boom box, retro arcade games and Lego toys. As the title suggest, these are happy items reflecting happy times. Interestingly, the tide turns near the back of the gallery with “Revenant” and “Accession” to the nearly all-black spray paint and acrylic paint on wood with repeated imagery of a heart and triangle. The carefree fun of the 1980s seems to be morphing into the dark grunge of the 1990s. His style seems to evolve into more expression with the four “Spectre” paintings in pink, green, blue and yellow. Just one color per painting suggests hesitation for this more experimental and organic style where the acrylic paint seems to be poured on and left to appreciate the medium in its purity, unlike the strictly painted boxes. The three “Portals” of window screens with spray paint are quite frustrating to look at. With the bright light, the screen moves providing a dizzying effect as you attempt to figure it out. This is perhaps more of the artist’s play with definition and informality vs. formality. A viewer’s experience also has meaning with the three large “Pods” sitting along the center of the gallery floor. Made of acrylic and latex paint on masonite and wood, his vivid color and precisely formed shapes jut out at you from all sides. According to the artist, the pods are meant to hang from the ceiling to spin around and view from below, but, the Hilmer Gallery’s ceilings weren’t strong enough to hold them. As it is, viewers must do their own spinning, which seems to add to the playful aura of the show. Oliveto’s “Table Lamp 3” seems a little out of sorts in the show. The acrylic paint on masonite with brass screws and light bulb shows the artists practical side which is somewhat random and confusing amongst the rest of the solely visual art in the show. Nonetheless it is interesting to see another awakening moment for viewers to experience. All in all, the show is unlike most shows around the area at the time—most people hesitate at exhibits that showcase work that isn’t necessarily “classical” or “provocative.” But Oliveto’s play with his youth mementos and serious practice of minimalism is a refreshing and highly qualified case in point that not all work needs to be traditional, and absurdity is all right. Tony Oliveto Recent Works is on view through February 24 at Hilmer Art Gallery on College of Saint Mary Campus, 7000 Mercy Road. Artist reception is February 9, 5-7p.m. Visit csm.edu or anthonyoliveto.com for more information.